Can you think of a 10-to-20-year committed relationship where the spark of romantic intimacy and sexual adventure has remained strong and thriving? If that’s tough to answer, take heart. For several years I’ve researched sexless partnerships in marriages and committed relationships for the purpose of exploring ways that will effectively revive passion and desire. Without positive attitudes and nurturing behaviors by couples who are passionate about growing their love, commitment will dwindle and die—or lie dormant in the deep freeze of indifference. Let me emphasize that little four-letter word, love. Love is what stirs the hearts of happy couples. It’s the basis of everything good and strong and pure and healthy in relationships. In case you think the loss of intimacy is an infrequent or irregular thing, think again. 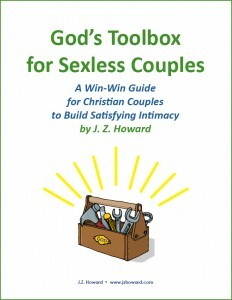 My focus leans toward Christian couples and their attempts to find solutions, but the problem of missing intimacy, including the lack of 1-to-1 emotional and spiritual connection, plagues many sorts of couples, secular and religious. Try this. Google “sexless marriage” and count the pages designed for miserable partners who pour out their sorrows, including pages on the Huffington Post and Wall Street Journal. Also, Google “sexless marriage forums” and you’ll find, among others, The Experience Project’s forum “I live in a sexless marriage.” Note the number of members: 49,000+. Can you see these barriers working in your intimate relationship? Which of these is the most resistant to change? For an in-depth look at ways to overcome these barriers to intimacy in Christian relationships, get my free guide: God’s Toolbox for Sexless Couples.